AARON FINCH insists that Yorkshire have yet to see the best of him as he prepares to ignite their challenge to win the T20 Blast. The Australia T20 captain is back for his second spell with the club and goes straight into the side for tomorrow’s match against Northants at Headingley (2.30pm start). Finch scored 256 runs for the county in 10 T20 games last year at an average of 25.60, a frustrating return for one of the world’s best players in the format. But Finch showed his star quality with innings of 89 against Nottinghamshire at Headingley and 88 versus Lancashire at Old Trafford, and he has unfinished business after returning as the club’s premier overseas player. “Last year I was disappointed with my T20 form,” said Finch, who was to have arrived at Yorkshire towards the end of last month only to tear a hamstring while playing in the Indian Premier League in April that resulted in a lengthy lay-off. “There were a couple of decent innings in there, but my consistency wasn’t really there, and hopefully this year I can win a couple of games for the side and really be someone at the top of the order to get us off to a good start consistently. “I have to say that I’m feeling really fresh, and I can’t wait to get back into it after my injury. Finch, who still holds the record for the highest innings in a T20 international (156 against England at Southampton in 2013), warmed up for tomorrow’s contest by playing two T20 games against Northants for the Yorkshire second team at Barnsley on Thursday. He scored 13 and 32 in his first outings since tearing his left hamstring playing for Mumbai Indians against Rajasthan Royals in Ahmedabad on April 14. “It’s obviously been pretty frustrating being out for a few weeks, and sitting around at home was doing my head in a little bit,” said Finch. “But my recovery was actually about five weeks ahead of schedule, and all those frustrating hours at home doing what I thought was pointless rehab at the time has been worth it. Finch, 28, exudes enthusiasm for Yorkshire cricket and he had no hesitation in returning for a second spell. 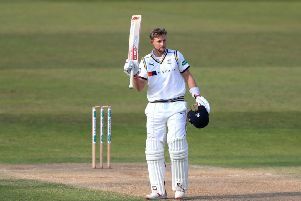 He will stay at the club until late August, when Australia begin preparations for their T20 and one-day international matches England, and he will be available for all cricket until then and serve as Yorkshire’s overseas player in the County Championship. “I’m looking forward to playing four-day cricket again, and it’s something I want more of,” said Finch, who scored 291 runs in five Championship games last summer at 48.50. “With international duties over the last couple of years, I haven’t played much first-class cricket. “Last year, I got one hit in Shield cricket in Australia, and the year before I had one game. “Just to be able to play a lot of cricket in a row, back-to-back, is always good, and it’s a good chance for me to get into the groove and just play day after day after day. Finch plays Championship cricket in preference to Glenn Maxwell, who stood in for two matches before Finch arrived in England last week. The Australian team-mates and close friends will both represent the county in T20, in which two overseas players are permitted, with Maxwell having joined Yorkshire on the understanding that he will develop his red-ball skills in the second XI unless Finch is injured/unavailable. The prospect of Finch and Maxwell combining in T20 is one to excite the Yorkshire supporters, with the club strongly fancied to do well in a format in which they have only once reached Finals Day. Finch believes it is hard to explain why Yorkshire have not done better in T20, and he is looking forward to helping address that with Maxwell. “When you look at the list (of players), there’s probably no reason why the side hasn’t been successful,” said Finch, “but now we’ve got a really well balanced team with youth and experience and it’s a good opportunity to force our way to Finals Day. “Once you’re there, anything can happen – hit a couple out of the middle and you can find yourself winning a title. “Maxi (Maxwell) is a fantastic player, and I’m really looking forward to playing with him.